Tickets include entrance to all attractions within Stirling Castle. Tickets are valid all day from 9:30am. Last entry is 45 minutes before closing. Enjoy the history of Stirling Castle in our official souvenir guide, taking you through page by page. 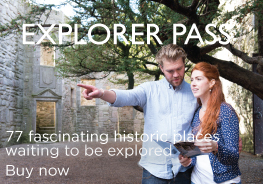 With beautiful photographs and a useful castle map it's the ideal souvenir. Available in 7 languages: English, Spanish, Gaelic, Italian, German, French and Japanese. Choose your language when you pickup your souvenir guide at Stirling Castle. Available for pickup at the castle only.